We eat for many reasons. Besides eating because your body needs food to live, we eat because we like it, it comforts us, because we feel tired, and because of stress. According to the American Psychological Association, as high as 75% of people experience daily moderate stress. One of the most common stress relievers for people is eating. While you may think it helps calm you down, it could actually be adding to the problem. The same can be said about exercising, or lack thereof. Understanding how the two play into the effects of stress will help you better manage it. How Does Diet Affect Stress? When consuming sugar, many things happen to your body. You easily notice several hours after drinking a large mocha latte or eating that second piece of cake you start to become sleepy. That is because your glucose levels dropped. Consuming sugar spikes your glucose levels. The up and down roller coaster effect causes the body to crash and look for alternative ways to conserve energy, which often leave you tired. If you give into the feeling of tiredness and consumer more sugary foods, your body again spikes and dips levels. Do this often enough, and it could lead to trouble sleeping. Depriving your body of sleep can lead to stress. Eating foods for comfort also affects stress by reducing the hormones that fight stress. Your stress-fighting hormone, Cortisol, feeds off the foods you eat. Besides sugar, trans fat and caffeine play a significant role in cortisol production. When you consume these types of foods, your cortisol levels rise. When faced with stressful situations, the hormone meant to help you keep your cool is not there. Over time, this can have seriously damaging effects on your help. 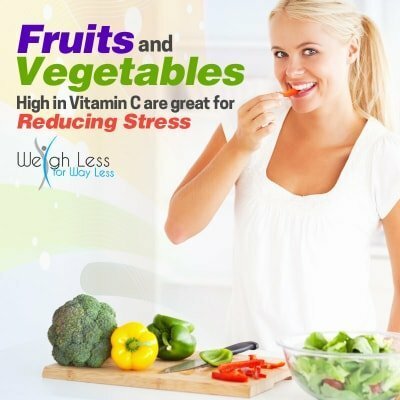 How Does Eating Healthy Reduce Stress? Nutrient-rich foods like fruits and vegetables are perfect to eat when you are hungry, tired, or stressed. Foods containing high amounts of vitamin C like berries, peppers, and broccoli are great choices. Beverages like chamomile, green tea, and flavor-infused water are the healthiest and best choices to consume. For those teeth grinders, clenchers, and food lovers who take comfort in crunchy foods opt for almonds or cashews. Nuts contain many important nutrients and the good kinds of fat that your brain and body need. Many people will tell you that working out is a great stress reliever. In fact, according to the Anxiety and Depression Association of America, 14% of people say they use exercise to reduce stress. 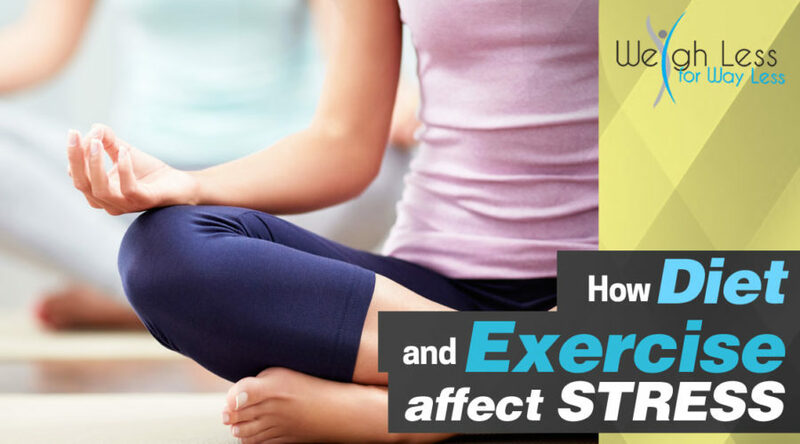 How does exercise reduce stress? When your body gets moving, your brain releases endorphins. This euphoric high that people describe is actually all of the good neurotransmitters sending signals to your body that help perk up your attitude. Regular exercise can help keep you fit which provides confidence. Exercise is also a great distraction. You have to focus on what you are doing to avoid injury, so your mind diverts away from your stressors. You do not need to train for a triathlon to feel the effect exercise has on reducing stress. But you do need to get moving. Consult your physician before beginning any exercise program, and always start slow if you are new to an exercise routine/program. As little as 30 minutes a day, 3 days a week is a great place to start. Light exercises like walking and water aerobics or swimming, help work the entire body. These exercises are great for beginners. If you’re looking for something a little more intense mix up your routine with weight training. Weight training two to three times a week helps build lean muscle and eliminate fat which also puts less overall stress on your organs. Healthier organs and bodily functions reduce stress. Another great option is to something that’s fine. A sport or group activity that keeps you moving can definitely help improve your mood. Organized Sports and activities help take your mind off of your stressors. You can also rely on others for positive encouragement and help. If you are looking to make positive changes and start reducing stress, schedule an appointment with Dr. Abboud and her team at Weigh Less For Way Less. We can help customize your stress management program. With three locations in the Chicagoland area (Elmhurst, Burr Ridge, and Oak Lawn, IL), your appointment is easy. Have a?question about?How Diet and Exercise Affect Stress? Join us in the comments! ?